IT’S NOT A BIRDHOUSE… IT’S A BOOK HOUSE! A bit of genius if you ask me AND a great way to foster neighborhoods and encourage sustainability. It’s a way to get us away from our personal technology devices such as kindles, ipads, nooks, etc and out into our communities, interacting with neighbors and friends. Take a book, leave a book. It’s a gathering place for neighbors to share literature and stories. 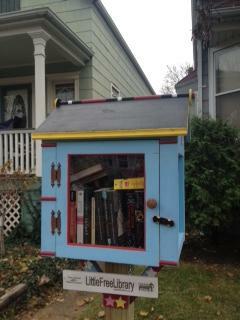 Little Free Library started in Hudson, Wisconsin in 2009. Their mission is to promote literacy and build community. There are already 10,000 little libraries all over the world. Check out the locations and find out how you can order a little free library for your front yard. And by the way it will increase your curb appeal.